Big Bite Dumpster Rentals Now 2 Locations! YOU FILL IT ~ WE HAUL IT! ​Big Bite low-impact trailers are safe on the driveway and will be carefully positioned with a standard size pickup truck. The potential for damage to driveway or landscape is all but eliminated. The only contact with the driveway is the trailer’s soft rubber tires. 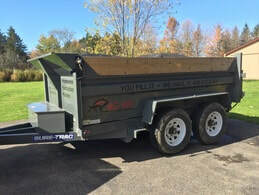 ​Big Bite Dumpster Rentals delivers a dump trailer to your home or business, you load the trailer with virtually any sort of junk or debris*, then Big Bite will retrieve the trailer. ​Take A Chunk out of your Junk! *Only non-hazardous materials can be placed in a Big Bite trailer and items must fit securely inside. *Additional charges for roofing material, appliances and tires. Call for pricing. *Big Bite disposes of junk in an environmentally responsible manner. Some junk will be recycled..